Which rooms of your house work the hardest? In most homes, the simple presence of plumbing will answer that question immediately. Kitchens, bathrooms and laundry rooms typically witness most of our daily chores—cleaning, cooking and washing—and much of our time is spent in one of those rooms. 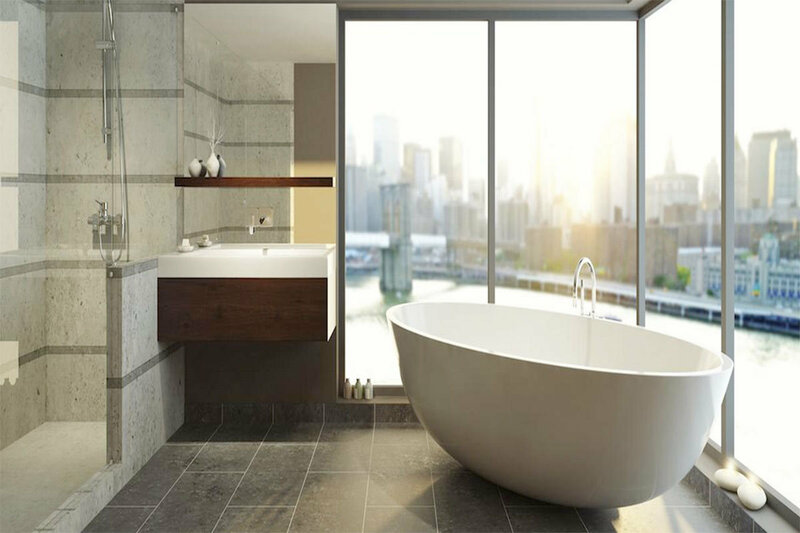 In many homes, bathrooms have become much more of a focal point than ever before. Older homes normally relegated bathrooms to nothing more than sheer functionality, typically packing a tub, a sink and a toilet in a cramped, utilitarian 5’ x 8’ space. Luckily the modern house has bigger, better-functioning bathrooms, carrying the style and décor of the rest of the home into that formerly plain, boring space. No, I don’t mean rock ‘n roll, although a bathroom with a small music system is always a welcome respite. Instead, try incorporating natural stone into your bath décor. Many tile and stone suppliers now have beautiful natural river rock available in handy squares and strips, ready for use as a flooring, countertop or backsplash material. If you don’t want to go commercial, stone is everywhere—at quarries, rock retailers, home improvement stores and by the side of the road. 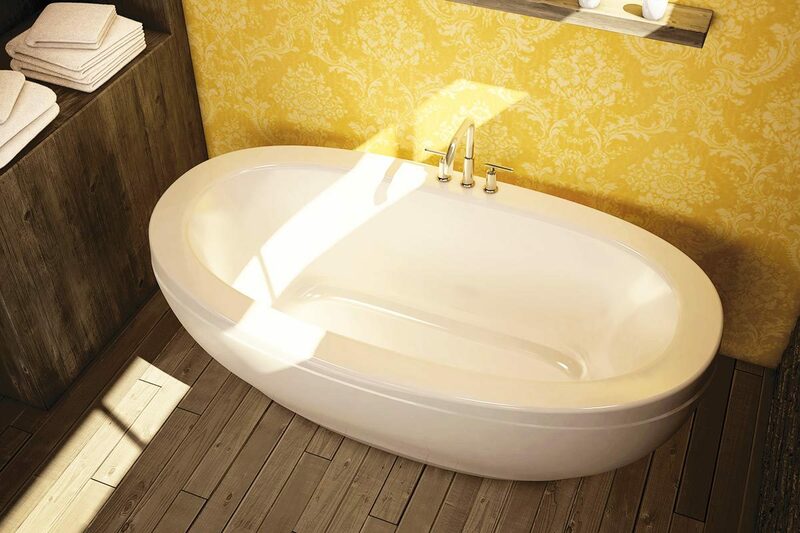 Most of the reasonably-priced, commercially-available bath vanities look a little mass-produced—because, well, they are mass-produced. So if you’re looking to replace or install a new vanity, think beyond the standard box. A recycled desk, a table, any horizontal surface with legs that can mount a sink will work. So many sink options exist today, including surface-mounted bowls with high, arching faucets, that it has opened up the vanity possibilities enormously. Bathroom a little boring? Install a couple of inexpensive, wall-mounted shelves, and rotate some art through the powder room! Just about everyone has a few spare picture frames around the house somewhere, so find photographs or magazine graphics or online art and frame it for the delight of your bathers. Set your new artwork on your shelves and your bath instantly becomes a gallery. In the oldest and most elaborate Victorian homes, bathrooms had fireplaces to ward off the chill of an early morning plunge into the giant, footed cast-iron tub. We’ve largely lost the distinct pleasure of bathing by the fire, but the new generation of electric console fireplaces can give it back pretty cheaply and easily. Made in multiple sizes and configurations and styles, many of these new fireplaces are safe for wet environments, although you should check before you buy. Does your bathroom have cheesy vinyl flooring, or even worse, carpet? (Horrors!) Is it on the first floor of your house? Guess what? There’s a good chance that underneath your ugly bathroom flooring you’ll find a concrete subfloor. Rip that old, funky floor up, clean and stain the concrete, and apply a clear sealer. (Concrete is porous, so you have to seal it to use it in a bathroom.) 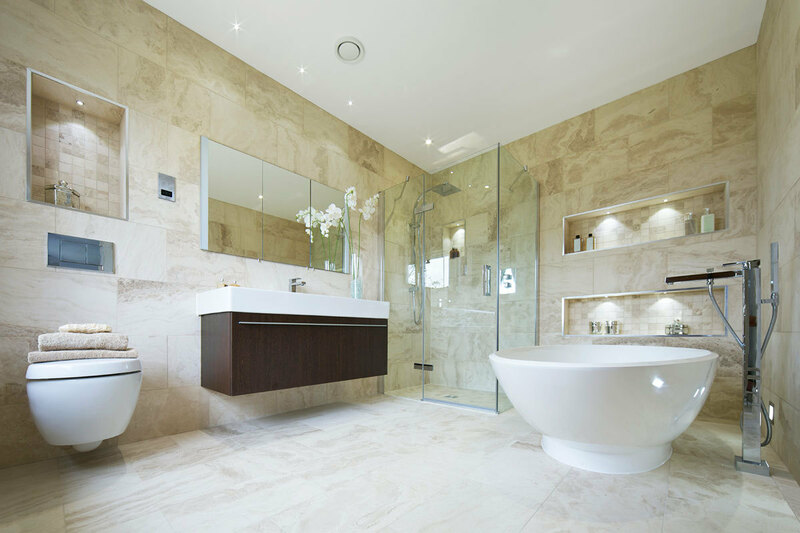 Stained and sealed concrete actually makes a wonderful and very stylish bathroom floor—you’ll find it in many high-end homes and commercial spaces these days. What happens to old glass bottles? They get recycled, many of them, into beautiful glass tiles that can be used in flooring, wall covering or even shower and tub enclosures. Naturally waterproof, beautifully modern and not that expensive, recycled glass tiles can completely transform the look and feel of a bathroom. One particularly creative bathroom I saw had a curving “river” of recycled blue and green glass tiles running through the floor and leading into the shower. Another great use for these versatile materials? Use them as a wall mosaic around medicine cabinets, mirrors and windows. One of the best ways to store towels, washcloths and bath essentials? A wall-mounted or countertop set of matching woven baskets. Any import store has a wide variety, and they can be varnished, stained or painted in interesting and creative ways, too. Baskets give a warm, hand-crafted feel to bathroom décor, keep stuff organized and off the floor, and cost so little that you’ll think you stole them. Expensive interior decorators and designers have a handful of consistently-applied tricks of the trade, and one of the best of them is repetition. Repeating small design elements or collectables makes for a visually-interesting and unique decorating idea. I’ve seen repetition of things like shells and starfish, all collected free on beaches, turn a bathroom into a tropical retreat; I’ve seen old bottles in various shapes, sizes and colors lined up on windowsills and shelves to reflect light; I’ve seen mirrors in different configurations mounted on walls—and all of those repeated motifs made the bathrooms they graced much more interesting places.